Ice cream benefits from being made sous vide as cooking it in a vacuum bag prevents the possibility of the custard catching on the bottom of the pan and ensures that it will never go above the desired temperature and therefore cannot curdle or ‘split’. Another benefit is that the ice cream can be handily stored in the vacuum bag until it is ready to be frozen and will keep for three days in the fridge. 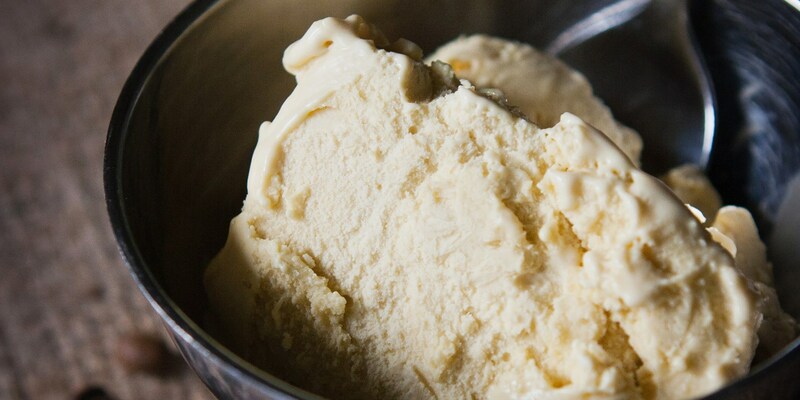 This ice cream base isn’t just for vanilla; try infusing the milk with tea, orange zest, cinnamon or lemon thyme to name but a few flavourings; just remember to pass the mixture through a fine sieve before churning. Other ingredients can be added too, anything from melted chocolate to strawberry purée or even whisky. Play around with the flavours you prefer or have a look at our ice cream collection for inspiration. Matthew Tomkinson serves a decadent Coffee ice cream, while Anna Hansen’s Honeycomb ice cream is hard to resist and for something a little more unusual why not give Alfred Prasad’s Fennel and ginger ice cream a go.